He shoulda watched where he stepped…. What’s a poor writer to do? someone, some day, for some reason, will annotate you: and naturally, being long dead, you won’t be up to defending yourself. 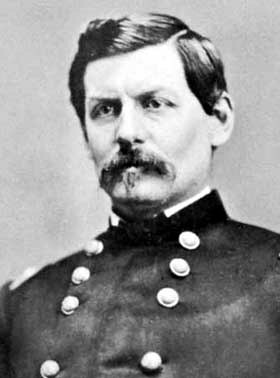 And so it is with the writer of a biographical sketch of the 19c American general George McClellan, famous for being so cautious not to lose battles that he would have lost the war had he not quickly been replaced by President Lincoln: our anonymous writer had the misfortune to use what was at the time a fairly conventional phrase — but one that in our own age, less attuned to the classics, got him a dose of annotation right between the eyes. I prolly wouldn’t mention any of this if (a) it weren’t a somewhat out-of-the-way place for this item; and (b) if it weren’t considerably better than the corresponding Wikipedia entry, yet very likely at the cost of half the expenditure of time. Jona, you’ve been there, and will doubtless have further, um, annotations on it all.